As a lineage, scorpions are very old, indeed. The earliest fossil scorpions turn up in rocks formed in the lower Silurian Period, over 420 million years ago. That's about 200 million years before the dinosaurs appeared. These earliest scorpion fossils are similar in many ways to the now-extinct eurypterids (also called giant water scorpions) from which they are thought to have descended. 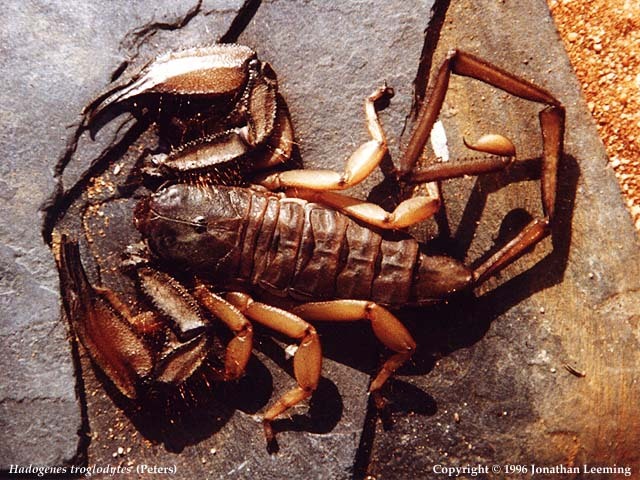 In fact, it would be perfectly correct to refer to scorpions today as eurypterids. Ancient scorpions had large, compound eyes, an extra pair of book lungs, poorly developed preoral chamber, and legs that were not yet specialized for walking on land. Unfortunately, we know very little about these ancient scorpions. How they lived, what they ate, etc. In fact, there is considerable debate over whether they lived on land or in the water. A few of these fossil scorpions may have reached a total length of nearly 1 meter. 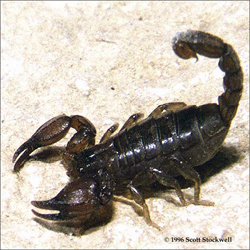 Those of you who live in scorpion country and have found them in your homes can imagine how exciting it would be to discover a toddler-sized scorpion hiding behind your washing machine! An early scorpion, Allopalaeophus caledonicus, from the Silurian Period, about 420 m.y.a. The lineage that modern scorpions belong to first appeared in the late Carboniferous Period, about 300 million years ago. They have changed little since that time. 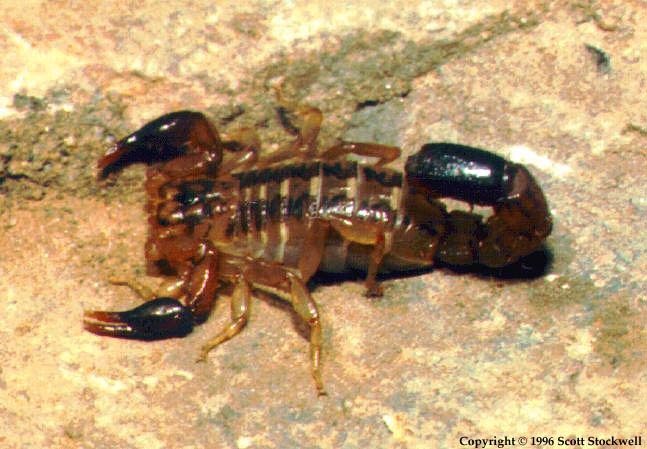 The South African Rock Scorpion, Hadogenes troglodytes, is probably the longest. Males may reach 21 cm in length. But these scorpions are very flat and possess a very long, narrow metasoma, so they may not be the largest by weight. 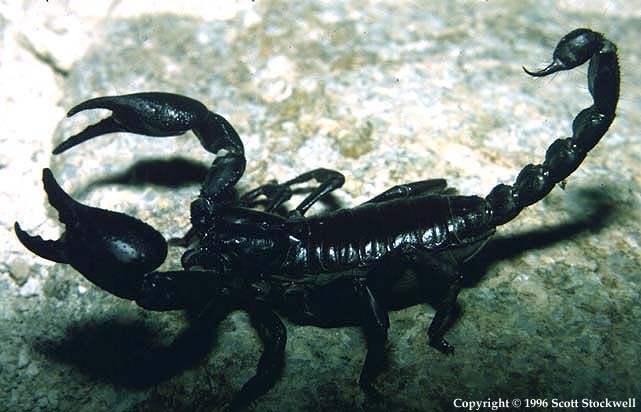 The heaviest scorpions are probably a couple of species of Pandinus, from Central Africa, and Heterometrus, from Indo-China. These scorpions have thick, heavy bodies and appendages and may reach 17 cm in length. A couple of fossil scorpions, e.g., Brontoscorpio, may have been as much as 1 meter in length. This is only an estimate though, because complete specimens of these large scorpions have never been found. The largest nearly-complete scorpion fossils known measure about 40 cm in length. There are several very small species, but the smallest may be Microtityus waeringi, the smallest of which measures a scant 12 mm when fully grown. One of the smallest scorpions in the United States is Vaejovis waueri, which reaches a length of 23 mm. Scorpions are unusual among arachnids in having life spans that last more than one season. Their longevity is affected by several factors. Among them are temperature, food availability, stress, predation, etc. Scorpions in tropical areas tend to develop faster than similar scorpions in more temperate areas. Most scorpions develop to maturity in 1 to 3 years and live 1 to 3 years as adults for a total lifespan of from 2 to 6 years. The shortest lifespan reported for a scorpion is just under two years. The longest lifespan reported for a scorpion is 8 years. People often ask how long their pet scorpion can be expected to live. That depends on what species of scorpion you have and how old it was when you acquired it. 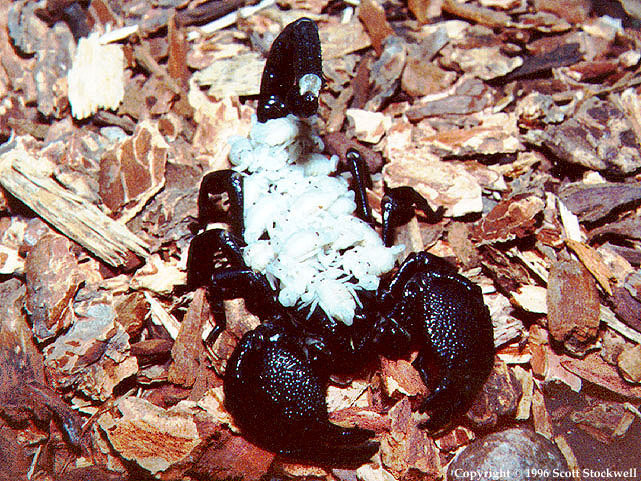 The most common pet scorpion is Pandinus imperator, the emperor scorpion. They typically require about 3 years to reach adulthood. They may then live an additional 1 to 3 years as adults depending upon a great variety of factors. Most emperors are sold as adults, so they already have at least half of their lifespan behind them. Consider it normal to get an additional year of life out of your pets and very fortunate to get an additional two years of life. On the other hand, of course, some individuals might be at death's door on the day they are sold. It is therefore not unusual to have a scorpion die of old age within weeks of its purchase.